Genus summary: All bees commonly known as “bumble bees” are in the genus Bombus (BOM-bus). There are approximately 250 species of Bombus in the world, 40 species in North America and approximately 26 in California. Bombus are primarily found in temperate climates and are particularly important pollinators in alpine and arctic environments. There is a subgenus of Bombus called Psithyrus that are social parasites on other Bombus species. A Psithyrus queen enters the nest of a non-parasitic Bombus and kills the queen. The workers of the raided colony then provide for the Psithyrus female and her offspring. 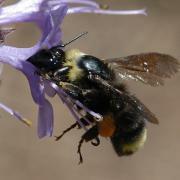 Keys: There are good keys to Eastern US Bumble bees and Western US Bumble bees. Description: Bombus are very hairy and large, with yellow, black, orange or red bands. Both the thorax and abdomen will be covered in hair. Under a microscope, you can see that these bees do not have a jugal lobe on their hind wing.They have several physiological adaptations that allow them to fly in cold or cloudy weather. They range in length from 0.4 to 0.9 inches (10 – 23 mm). Species in this genus have very similar body shapes, but can be distinguished by their color patterns. Members of the Bombus subgenus Psithyrus lack pollen-gathering structures because they do not visit flowers but instead steal pollen from other Bombus species. Bombus females carry pollen wetted with nectar on their corbicula, a smooth, bowl-shaped structure ringed with long hairs on the upper part of their hind legs. Bumble bees make a low buzzing sound when flying, usually in a characteristic awkward or “bumbling” pattern. The species are often told apart by the color pattern of their hair but even this can vary within a species so, other traits are also used such as face length and the placement of ocelli. Male bumble bees are even harder to identify than females because color patterns are even less reliable for males. There are two excellent resources for identifying bumble bees, Bumble Bees of the Western States by Koch, Strange and Williams and Bumble Bees and Cuckoo Bees of California by Thorp Horning and Dunning We have provided diagrams for the most common bees in the back of the book. In the late 1990's, bee taxonomists began to notice a decline in the abundance and distribution of several bumble bee species, including many bumble bees that were formerly among the most common species in North America. There are a number of threats facing bumble bees that may be leading to the decline of these species, including the spread of pests and diseases through commercial bumble bee rearing and transportation, habitat destruction or alteration, pesticide use, invasive species, and climate change. Bumble bee expert Dr. Robbin Thorp (Professor Emeritus, U.C. Davis) has hypothesized that wild populations of the closely related species Bombus occidentalis, B. affinis, B. terricola, and B. franklini were infected by an introduced disease carried by commercially reared colonies of B. occidentalis and B. impatiens. Two California Bombus species are on the Xerces Society Red List of (Endangered) Pollinator Insects. Franklin's Bumble Bee (Bombus franklini) is listed as “critically imperiled” and possibly extinct. The Western Bumble Bee,(Bombus occidentalis) is listed as “vulnerable” and is in sharp decline. 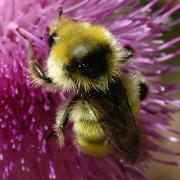 The Western bumble bee was once very common in the western United States and western Canada. It was arguably the most common bumble bee in San Francisco until the 1990’s. Our recent surveys of San Francisco were completely unable to locate this species. B. occidentalis can still be found in the northern and eastern parts of their historic range, but the once common populations from southern British Columbia to central California have disappeared. This bumble bee is an excellent pollinator of greenhouse tomatoes and cranberries, and has been commercially reared to pollinate these crops. In the past, it has also been an important pollinator of alfalfa, avocado, apples, cherries, blackberries, and blueberry. Similar insects: A number of species imitate bumble bees including other bees, hawk moths, flies and even beetles. Bumble bees are similar to Xylocopa, carpenter bees but they are generally furrier. 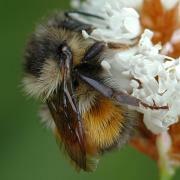 Food resources: Bombus are among the first bees to emerge in spring and the last to die off. The large queens are often found foraging on early blooming willows and Ceanothus. They are generalist foragers, and visit a succession of flowers throughout the flowering season. Many Bombus species have long tongues that enable them to access nectar from deep flowers such as monkshood, foxgloves, and lousewort. Some Bombus species are managed for the pollination of crops. Bombus are more efficient pollinators than honey bees (Apis mellifera) for many crops, including tomatoes, cranberries, raspberries, blueberries and field beans. For some species like tomatoes, the pollen is stored in the anthers until the anthers are vibrated at particular frequencies (middle C will work). When the anther is vibrated, it releases its pollen. Honey bees are unable to vibrate whereas bumble bees do it with facility. Bumble bees can also pollinate for more months of the year because they are able to work under cooler temperatures than Apis mellifera. Nests: Bombus nest socially in annual colonies that they build in abandoned rodent nests, grass tussocks or other pre-made cavities. Nests of some species grow to hold over 1000 individual bees, however, it is more common to have nests that are smaller than 50 bees. Queens overwinter alone and establish a new nest in spring. Bombus brood cells are unique among all bees; they are closed and grow with the larvae. Sometimes there is more than one larva within each cell, and the cell buds as the larvae mature. The queen forages for a short time to collect provisions for her first brood. Once this first brood of workers is ready to take over foraging, the queen remains in the nest to lay eggs. Flight season: Queens fly in spring. Workers fly in spring, summer and fall and new queens and males fly in the late summer and fall.